Review: The Witches at Curve Leicester. – East Midlands Theatre. Review: The Witches at Curve Leicester. 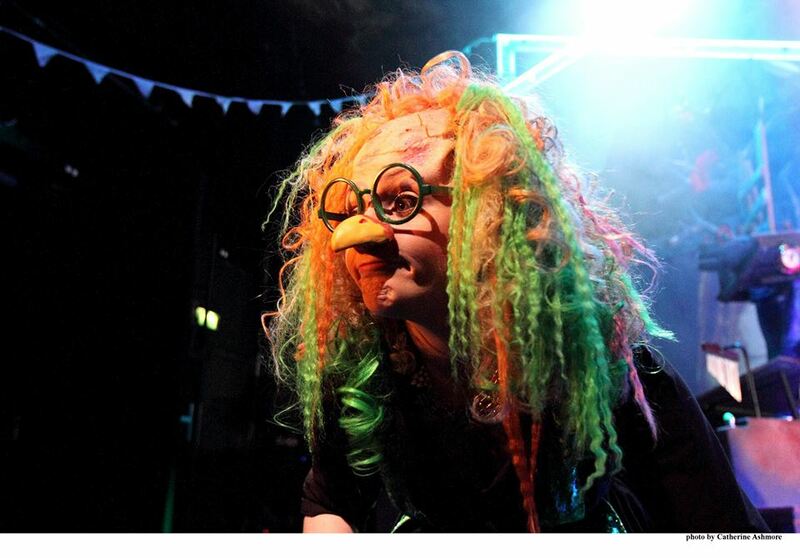 Roald Dahl’s The Witches, adapted for the stage by David Wood and directed by Curve Leicester’s Nikolai Foster is the first production Curve have developed for families and children in their studio space and it proves a wickedly non-stop spellbinding hit for any family to enjoy. In conjunction with Rose Theatre Kingston, Curve have formulated a comically gripping show that amuses, frightens, entertains and stays very very close to Dahl’s original story through David Wood’s fantastic adaptation. Any fan of Roald Dahl will be ecstatic watching one of his most popular stories come fizzing magically to life on this exciting studio stage at Curve Leicester. The seven actor-musician members of the hard working and talented cast play not only specific roles but, also a myriad of other wacky characters as the fast paced, seventy-five minute long, theatre piece unfolds. The pace never lets up and the audience appear to be having as much fun as the cast. 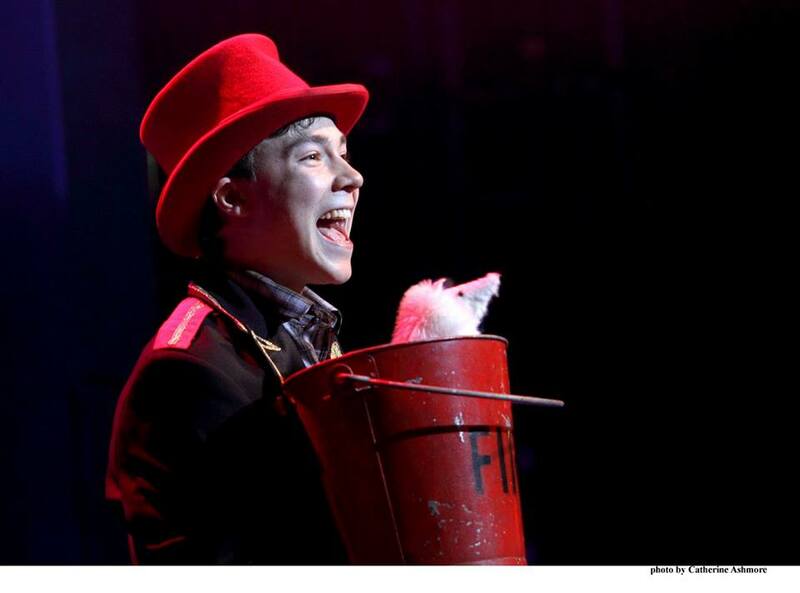 We gasp in wonderment as a loopy witch gets blown up and two boys turn in mice before our eyes – instantaneously becoming acrobatic rodents leaping and skittering around the stage. 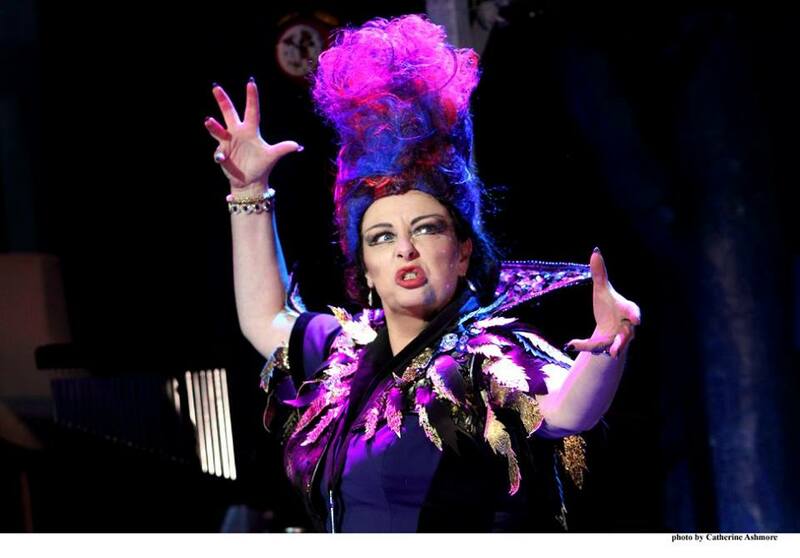 A powerful voiced and very funny (so grovelling sorry, one meant truly terrifying, O Brainy One) Sarah Ingram plays the Grand High Witch to nutty perfection and has a fabulous stage presence and singing voice. Boy is winningly realised by ex West End Billy Elliott star Fox Jackson-Keen. Once again he is as sympathetically rodent-like as he was in the 2013 touring version of Philip Pullman’s I Was A Rat. 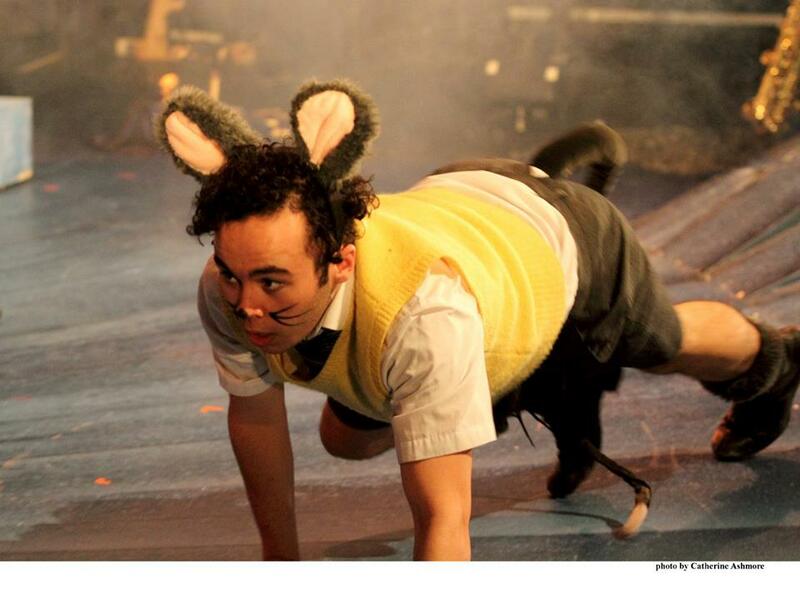 His constantly famished fellow mouse Bruno is played by Kieran Urquhart and is delightful in his moments of utter panic as he eventually realises his permanent transformation into a mouse. Karen Mann carries a wealth of warmth about her in her strong performance as the central figure of Grandma. The grandmother is based on Roald Dahl’s own mother, one of the most important influences in his life. She was a wonderful story-teller and had a great memory for detail. Sioned Saunders, Elexi Walker and Justin Wilman are marvels of quick change, rapid personality alterations, physical dexterity and musicianship and make the piece a detailed utter joy to watch. Designer Isla Shaw’s glorious costumes and set have a fifties feel about them with added flamboyance. The flexible set features an iron spiral staircase and grand piano, movable set pieces suggesting venues, projections and plenty of colour to delight the senses. The input of magic consultant Neil Henry is totally invaluable in bringing the magic alive in Boy’s world and the evil world of madcap sorcery of The Witches. The thrilling lighting design is by David Phillips and the often explosive sound design is provided by Sebastian Frost. The terrific musical work by composer Dougal Irvine thoroughly enhances an already excellent script in this multi-faceted show. The Witches at Curve proves the perfect evening’s theatrical entertainment for all the family and a wonderful companion piece to Oliver! next door in the main house as both stories are about young people overcoming great adversity and finding love in their lives. The Witches at Curve runs 9 December to 10 January 2016 then transfers to The Rose Theatre Kingston.